Great gifts. Notecards and Michael Domina prints are still availabe. Those of you attending this year's "Candles and Carols" probably noticed the awkward step over the threshold and the temporary floor as you entered Pratt Hall. Well I just received notice that our application to the State of VT, Division Of Historic Preservation, for a 2010 Historic Preservation Grant was approved. We asked for $7,500, which we must match, for structural work on the base of the clock tower and entryway. This is the first grant money for this kind of work we've ever received. The State indicated they received 42 applications this year with requests totaling just over $485,000. They approved 19. We were successful thanks in part to two earlier grants from the Preservation Trust of VT that helped pay for an architectural evaluation and an expert technical report. Thus we were able to lay out our need and convince the grant evaluators we were a strong, community supported organization, committed to the preservation of this important landmark. As some who have worked with grants may appreciate, sometimes the application part is the easiest. We now need to: complete a detailed work description; get three bids; award the project; and administer the grant, including all the financial paperwork. As with many grants we will have to pay the bills first, then file for reimbursement. This may require arranging for some additional short-term financing too. We can fulfill our grant match obligations with cash, donations of services in kind, and/or donations of materials. Here's a short version of what we will be doing. We will remove the existing steps and ramp, repair or replace the existing tower foundation and sill, replace the existing floor system in the entryway, then build a new set of steps and a ramp. The work must be complete in 2010. Wish us luck, or better yet join in when and where you can. 2010 Candles and Carols "the best ever"
Dec 18th's "Candle and Carols" was the perfect event to help us Grinch-leaning individuals get into the holiday spirit. The program was a combination of stories, dancers from Kathleen McKloskey-Scott's Ballet Arts School, and singing. 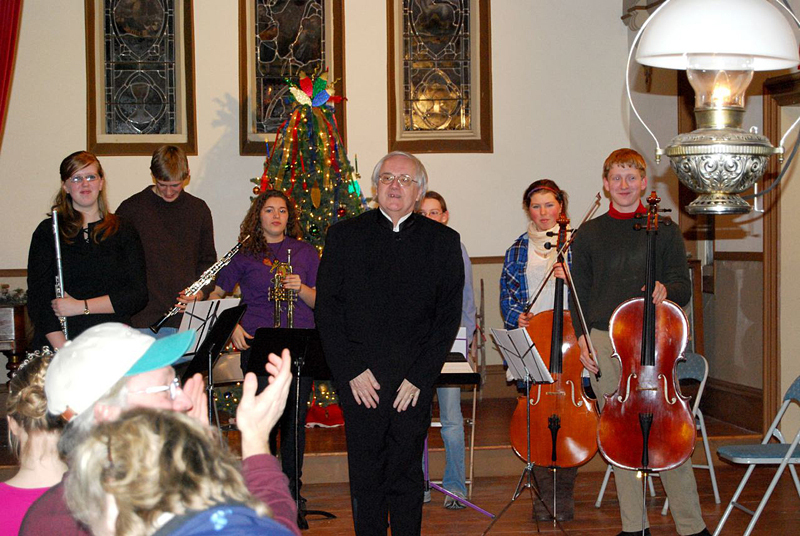 This year our carols were accompanied by six wonderful young musicians from the Vermont Youth Orchestra, and we were all led by the patient, talented and sometimes confused Andrew Massey. Many thanks to all of you who helped make this so much fun. The 2009 meeting of the VT League of Local Historical Societies was held in St Albans in November. Pat Farmer and Scott Perry attended and enjoyed the guest speaker and seminars on archives and involving youth. The highlight was a walking tour of the "Raid on St Albans" by the St. Albans Museum's military curator. Dressed as a Union Army enlisted man, he took us through the raid minute by minute, and location by location, with pictures of each location at the time of the raid. Did you know there was a hotel where City Hall now stands and that the leader of the raid, Lt Bennet Young, stayed there the night before? 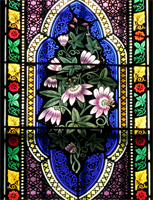 You can arrange for a tour by contacting the St. Albans Museum. Both the Museum and the tour are highly recommended. Last newsletter we announced any MHS member desiring a tour of Pratt Hall for themselves or guests can do so by contacting any member of the Board or emailing us at pratthall@gmail.com. Please bear in mind the heat and water are not on in the winter. We can still do tours, but it may be a tad chilly and the bathroom will not be available. We finished 2009 with 215 memberships totaling over $10,500.00. Additionally the Society received special donations in honor of Morgan Daybell, Beth Crane, Roman Daybell, and Karen Frascella. Thank you all. After an extensive review by Board members Pat Farmer and Ken Secor, the Board adopted a change to our insurance policy. We raised our deductible and increased our coverage to better meet major damages to the building, including the stained glass windows. This is made possible by the sustained generous support of our membership. The MHS is excited to offer for purchase, beautiful Limited Edition prints of Pratt Hall from the original water color by Montgomery artist Michael Domina. There will be just 100 of these 10 X 14 giclees produced in cooperation with Michael, and they will be numbered and signed by him. The prints can be purchased for $50.00 each. Postage and shipping, if required, will be additional. As a special incentive, the Artists In Residence/Village Frame Shoppe, in Enosburg, is offering 25% off on custom backing, matting, and framing for this print. They can be reached at 802-933-6403; ask for Dan Patullo. Thanks to Michael and Dan for their generous support. There were at least three other churches no longer standing...the French Baptist, the Hectorville Union Chapel, and the Evangelical Advent Church on West Hill.